Oahu is much more than Honolulu and that applies to real estate as well. It makes sense that the economic and political center of not only the Island, but the entire State looms large in every aspect of life here. That dominance overlooks the fact that there are a number of luxury neighborhoods outside that city’s limits, each with their own charms and natural marvels that put their residences at the apex of Oahu homes. 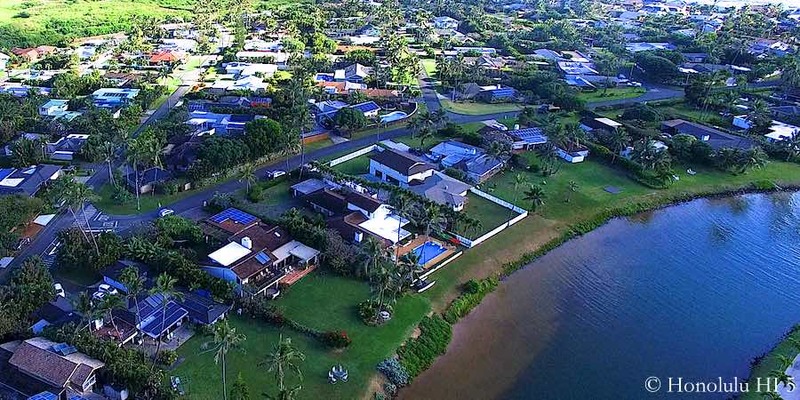 We’ve assembled 7 that make up the Most Expensive Neighborhoods Outside of Honolulu. Based on the number of listings that have sold for more than $2M over the last 5 years, they all bring more to the closing than a large house. Much more. Spread out across the entire Island they make up an elite and enticing collection. Learn what makes them so alluring to buyers who line up for a chance to call these Oahu neighborhoods homes. 41 homes sold for over $2M in the last 5 years. Residents in Beachside are probably among the few Kailua locals who don’t mind the tourists and outsider crowds flocking to Kailua & Lanikai Beaches. While the neighborhoods beside that famous duo must contend with growing traffic and less space on their sands, Beachside sits just up the coast, off the radar of the daily throngs. Stretching up the entire way from Kailua Beach Park’s northern end to the end of the Oneawa Channel near Kaneohe Marine Corp Base, the majority of the community is made up by the makai side of Kalaheo Avenue. The homes in Beachside run off of that main thoroughfare along a series of short roads that kiss the beach at their end, providing widescreen views of the Mokes, wondrous Kailua Bay and the Pacific rolling its way to you waiting on the shore. Though the beaches are public, these mainly luxury homes are protected by the high profile sands south of them, meaning these stunning sands have fewer visitors, yet have a beauty on shore and off that matches their better known neighbors. If there is one place one wants to live in the extremely hot market of Kailua, Beachside is it. 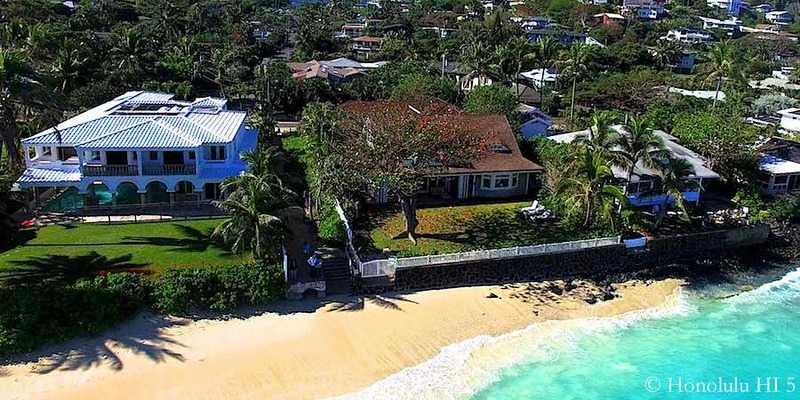 You still will find classic beach cottages, smaller, yet exquisite vintage Kailua homes as well as larger Kamaaina residences that show the wealth and yet restraint of that class. These structures are nothing less than soothing time machines to a more serene, more elegant era in Hawaii. The still substantial presence of those homes here is clear from the fact that vast majority of those $2M+ sales come from listings built in the 1950s – 1970’s. The attraction of these lands has also resulted in newer luxury houses, built especially since the Millenium that vary in style, but have all the comforts expected in a neighborhood where listings inevitably reach into the 7 figures. The greatest comfort, though, is just being here, in oceanfront Beachside. 8 homes sold for over $2M in the last 5 years. Kaimalino picks up where Beachside ends, on the other side of the Oneawa Channel where it heads out into the ocean. Though the first lots were built on in the 1950’s, you’ll find that Kaimalino homes are newer and, on average, larger than Beachside. That applies to not only the interior dimensions, but also the property sizes as well. This greater room on the property and the expectations of more modern residences means that you’ll find a high percentage of swimming pools and lounge/entertaining areas, features difficult to fit in the more crowded lots elsewhere in Kailua. 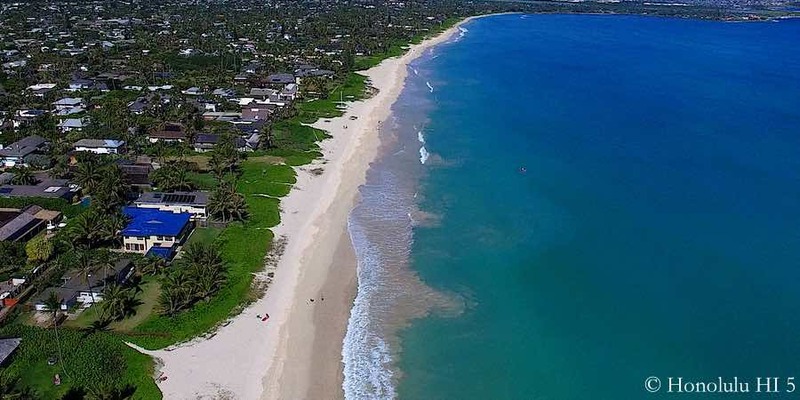 Those on the eastern shoreline, as well as along the coast where the channel enters the ocean, benefit immensely from their extension out from the mainland of Kailua. 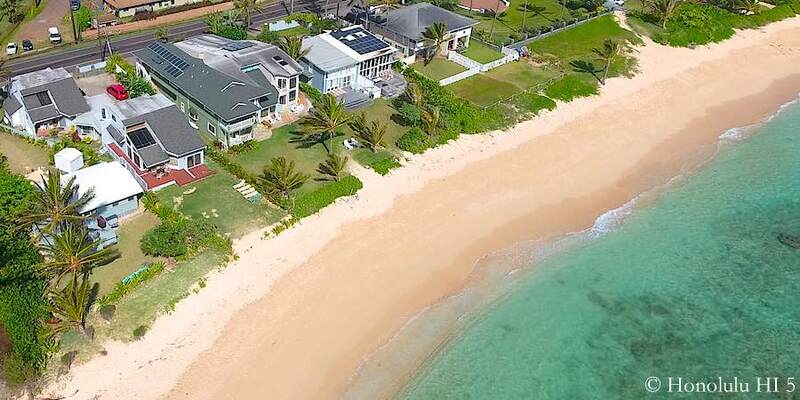 From these luxury homes you have an outlook down to Lanakai as well as the privilege of the awesome sweep of the Pacific playing all around you. The oceanfront is rockier up here and the sands not so plentiful, but, combined with the relatively out of the way location of Kaimalino, those rocks act as an effective repellant for outside visitors. Rarely will you find more than a few scattered figures on ‘your’ stretch of Kailua’s shore. Those seeking something of more recent vintage, with greater separation from the more hectic atmosphere Kailua is experiencing, will be very pleased with the luxury homes of Kaimalino. Living on the North Shore is a dream for many, not just on Oahu, but around the world. If more knew about the homes in Kawailoa, that number would be even larger. 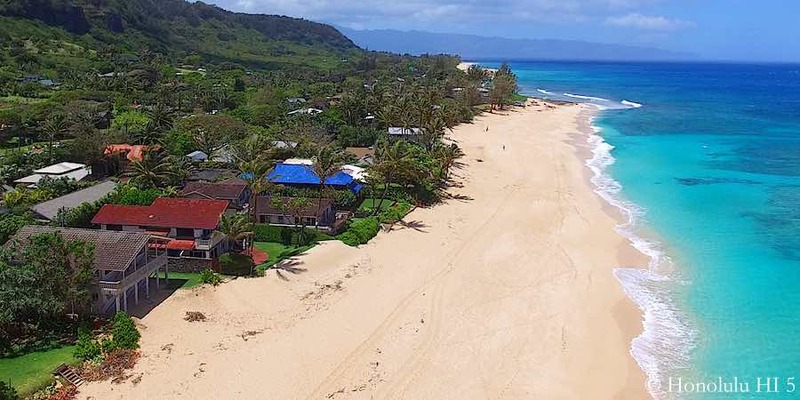 Just 2 miles from Haleiwa Town Center, walking distance to the shopping and dining center of this coastline, yet far enough that you’re firmly in rural territory, with open, green lands surrounding you. The makai side is pretty good, too. This is prime Pro Surf territory, stretching between Haleiwa and Waimea, with Chun’s Reef falling inside your borders. 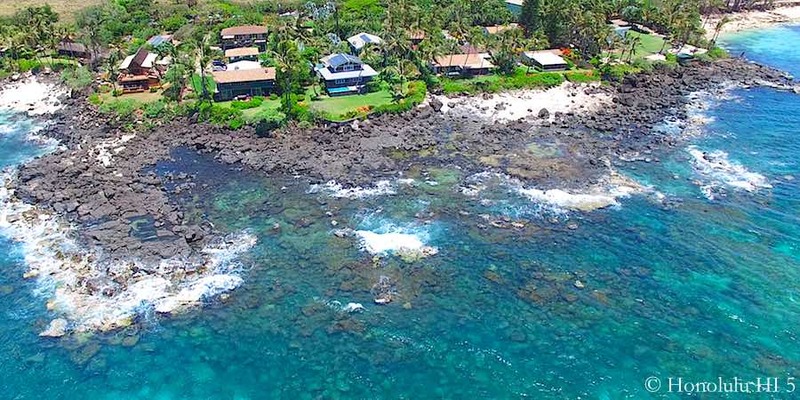 Approximately ½ of Kaiwaloa homes occupy oceanfront lots that gaze right out at these breaks, with much of the other ½ still retaining views of the towering swells that amaze the most jaded beachcomber. Kawailoa is a longstanding community from the days when living here meant almost complete isolation from the rest of Oahu. That history still lives here, evident by the fact that 4 of the 8 $2M+ houses were built in the 1940s or 50’s, although all were remodeled extensively in more recent years. The late 20th Century and particularly the Post-Millennium years have seen an upsurge of new building here, especially on the lots closer to the beach. A general rule of thumb is that the interiors get larger as you near the waterline, those recent additions being built to more modern tastes for roomier insides. Generally this is the apex of luxury North Shore real estate, and for good reason. Properties that line the ocean on some of the most world-renowned surf; Large, often opulent residences; Scarcity of properties, not just on the market, but overall. Fully immersed in the Country that makes this coastline special, you’re still just down the way from entertainment, shopping and excellent dining. It’s like having your cake and eating it, too. 45 homes sold for over $2M in the last 5 years. A survey of homes in Oahu will easily show that Lanikai holds the title of the premier Windward community. Its exclusivity rests on both natural and man-made factors, the best known being Lanikai Beach that causes weekend traffic jams that have become notorious. It’s a testament to the magnetism of this oceanside playground that it maintains such power even with Kailua Beach literally next door. It might be the head-on view of the Mokes, the exceptional clearness of its blue waters or the greater emphasis on relaxation, rather than recreation. Regardless, it is the foundation of the value of these lots. Not just because of their nearness to these sands, but also that the rise of the lands moving away from them opens this coastline and the waters off of it to houses set back from it. When one can’t live on ocean scenery so stunningly beautiful, having a view of it brings rich rewards, too. The entire neighborhood is a large cul-de-sac, with one road in that splits as it enters, running all the way to the geographically enforced end against a ridge and circling back to take you out again. It is this layout that creates the lines of cars at times, but also emphasizes the limited real estate not just available, but possible. Lanikai homes that have sold at or over our $2M mark have an extensive varieties of pedigrees. A number of them come from the 1920s to 40’s, large Kamaaina homes that often include guest/maid’s quarters. It’s clear that this neighborhood has had residents of means for the entire modern era of the Islands. Now you can live as elegantly as they did, with undoubtedly remodeled and modernized alterations for our 21st Century inhabitants’ requirements. As with other sectors of real estate in Oahu, the last 2 decades have seen some substantial residences erected that have brought something of Beverly Hills to the landscape in their greater sizes and high-profile style. Still, this is the ultimate beachside community on the Island, self-contained, roads busy with sun lovers making their way to and from the ocean and not one store or tour company in sight. When you live here, you gain not just a beach, but a complete lifestyle that pays you back on a daily basis. Mokuleia is one of Oahu’s most attractive neighborhoods, but has managed to fly under the radar. That is surely at least in part to the fact that it is about as far off the beaten track as you can get. It is a healthy, substantial community, but its location on the very western limits of the North Shore places it at a virtual dead end, with no resorts, shopping options or anything else that might attract anyone who didn’t live there. That isolation is a point in favor for many here, creating a sense of both gratitude and relief that their home remains untouched from the onslaught of development and tourism that has altered so much of Oahu – and will probably remain so. Sands stretch down the entire coastline here, creating a long beach perfect for walks and the waters are calmer than the areas to the east. The beaches in Mokuleia are marvelous for soaking in the rays, wading in the waters or just drinking in the Pacific Ocean’s displays of awe-inspiring power. It is not surprising that almost all of the 8 Mokuleia homes that put this community on our list are on Crozier Drive or Loop, those names bringing immediate recognition to in-the-know Oahu real estate professionals. Running right along the shore, they indicate not just an enviable piece of oceanfront property, but a luxury home to match it. What isn’t expected is that some of them date from the 1930’s or 40’s, beautiful Hawaii homes that show just how early the appeal of this neighborhood arose. More recent structures have joined them since, but still preserving the flavor of this out of the way, yet unique North Shore collection of houses that few may know of, but those who do are rabid fans. 30 homes sold for over $2M in the last 5 years. The Sunset area of Oahu’s North Shore needs little introduction. With the Banzai Pipeline break right off it, it’s a place that permeates the dreams of wave lovers worldwide. It’s an obvious, but definite, selling point to watch those fluid mountains rising and falling from an easy chair on your lanai. It’s a spectacle that unfailingly amazes, no matter how much you see them. Sunset real estate is more than even that, however. This is the thick of the North Shore, in all its wild and natural beauty from the green mountains climbing to the clouds on down to the turbulent ocean. The flourishing of nature is reflected in the beach that runs for miles, right in front of the Sunset homes. It is a uniquely deep beach for Hawaii, measured from the land to the waterline, that matches the size of the swells nicely. These lots are also unique for something else. Sunset is notable for the fact that many lots have 2 or even 3 homes on them, reminders of the family bonds that were always, and still are, strong in Hawaii. To accommodate that, it should be clear that the property dimensions are often quite large, bringing substantial land in the bargain. Sometimes as much as an acre. It’s part of the North Shore tradition of self-reliance and privacy that is still important in the local culture today. Along with those vintage Hawaii homes, large luxury homes stand on many of the lots and make up the other ½ or so of the sales included in our survey here. Few, if any, go beyond a discreet 2 stories, the focus always being the show outside. It’s a different life up here, filled with the treasures that the Islands bestow only so richly in a place such as this. 9 homes sold for over $2M in the last 5 years. The spotlight has gotten brighter on Waimanalo recently with its year 2015 topping of the Best Beach in the US list. The excellence of the shoreline here has never been a secret to locals, who have always rated it as among the very best on Oahu. Even so, this community has never succumbed to the commercialization or development that has penetrated even resistant Kailua just up the way. The presence of the Hawaiian Homelands has been important to that preservation and will probably be a solid bulwark against changes in this small town from ever happening. The two main areas of the community are comprised of the southern area, with the green walls of the mountains standing close in, requiring you to raise your head dramatically to see the sky over them. The other is the section closer to Kailua, where both sides of the road open up, the mauka side most of all. Driving on Kalanianaole Hwy is a tour through small town Oahu as it once was, with small diners and grocery stores scattered along the way, locals strolling down the side of the road and nothing standing beyond a 2nd story to be seen. It’s an old photograph of Hawaii come to life. What you will miss on your way are the luxury Waimanalo homes that line the ocean in both sides of the town. In contrast to the rest of the community, these $2M+ houses are the definition of wealthy residences, with huge interiors, striking architecture, soaring ceilings and the latest in comfort and technology. 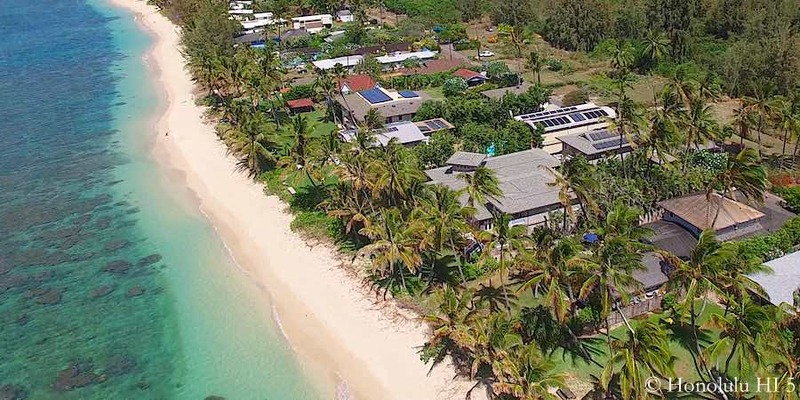 The masterpiece of the Pacific’s flowing shades seems to have been taken as a challenge by the owners to craft something equally engrossing on their beachfront lots. Of course, nothing could ever compare with the tranquil life and unspoiled sands that cover this community. However, some of these homes have taken a solid crack at it. A couple of million, or more, of Oahu real estate doesn’t guarantee a huge, modern mansion. As we’ve seen, in places like Sunset, it buys you a property with two average sized homes, for example. What you can rely on is that it is the key to a piece of land that puts you in the midst of one of Nature’s miracles, the splendor of Hawaii’s natural wonders. That’s important to remember. With enough money you can always build an amazing house. No amount of money will replicate the pleasures of watching the North Shore waves, the sight of the Mokes greeting you from across the water or the feeling that it’s just you and the sunset, saying Aloha to each other on another day in Paradise. It just isn’t possible.